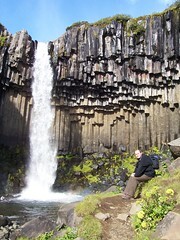 On 19 August 2005 Catherine and myself flew out to Iceland for a ten night touring holiday round Iceland. We drove round the country and saw many an exciting and interesting thing. This is one of many blog posts about that holiday – this particular post is about day six where we saw icebergs, glacial tongues, basalt columns and a very nice gorge! Don’t forget that you can see better versions of all the pictures on this page, simply by clicking on the image itself. On reading all about day five, Catherine asked me why I’d been so surprised to see processed cheese slices at the breakfast table at the Hotel Edda. Had we not had processed cheese on the menu every day? Ah no, I said. We just had humble sliced cheese. By processed I was referring to that lurid bright orange stuff with a delightful plastic taste – the kind that that McDonalds put on cheeseburgers. Hardly the worlds most appetising breakfast cheese really. That said, I now feel fit and able to continue writing this never ending stream of pieces about our holiday to Iceland. To recap, it’s the morning of Day 6, we’re in the fishing town of Höfn, and I’ve just woken up and want a shave. Yes, indeed I do know how to start a days posts don’t I? I know how to get you all hooked – eagerly awaiting with such anticipation, the next part of these epic posts which extol such excitement and interest in all readers everywhere. So yeah, I want a shave. It’s morning, I kinda do things like that. So I go to the bathroom with my new purchase of trusty disposable razor and trusty shaving gel. And then I realise a problem. There’s no plug in the sink. This is a bathroom that has a nice shower, plenty of soap, spare towels, a television aerial distribution system and a draw full of magazines that appear to be the Icelandic equivalent of Smash Hits and Just Seventeen, but there’s no plug. This means I’m having to wet shave with running water. This is not fun. As I’ve already said, I prefer my electric razor, and I haven’t actually wet shaved for years. I especially hate the way all your stubble comes out regimented, uniformly set at the same length as its neighbour – it doesn’t feel nice in the evening, and skinny women in flimsy negligees don’t turn up and softy stroke my chin like they do in the adverts. But even worse, not only don’t I get that, but I also don’t get the one thing that I really need to do wet shaving – a big basin full of nicely warm water. Instead I’m having to keep my face wet and my razor clean with a gushing tap of freezing cold water, whilst I mercilessly attack my stubble with two blades attached to a blue piece of plastic. It’s the kind of feeling that really tells you you’re awake in the morning. That torture done, we go off to try and find the dining room, which after several abortive attempts and searches, is revealed to be in the logical place of near a bathroom. There we are greeted by a woman who sits us down on one of two solitary tables in a corridor, before rushing through the doorway and then thrusting a plate in our hands which features a danish pastry with lurid pink icing, a bread roll, a little pack of butter, a slice of ham and a slice of cheese. Oh and she gives us a cup too. This rather confuses us – not least Catherine who’s wondering what to do about her slice of ham given she’s one of those vegetarian types who aren’t inclined to eat the stuff, but said woman has disappeared without imparting such useful information as directions to the coffee. It’s only after Catherine has followed her through the door (to get rid of the ham) that we find out that the dining room actually consists of more than two tables (this seemed logical given it was a sizable guesthouse spread over several buildings), that we’re in the overspill area and that’s there’s tea, coffee, orange juice and cereal on the other side. Having got food colour poisoning from the lurid pink icing (joke) we went back to our room, marvelled that the day had only just begun yet that I’d fill several large paragraphs of blog entry about it all, packed up, ditched the key and got on our way. Before leaving, we stopped the car near where we’d been the night before, and were pleased to find out that the view towards the glacier was just as lovely in the day as it was just as the sun was setting. A trip to the local 11-11 supermarket was then thwarted when it was oddly shut at 9:30 (before you start, there is actually a 10-11 supermarket in Reykjavik that opens at 8am and doesn’t shut until midnight. It’s like one of those 7-11s that are open 24 hours. Just plain wrong…) so we popped in the petrol station, bought some butties and got on for our first step of the day. 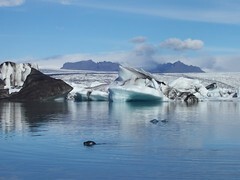 A glacial lagoon. 75km down the road we came to Jökulsárlón – a glacial lagoon where boat tours take you round the lagoon and show you all the icebergs. We booked ourselves on a trip, and whilst we waited, walked round the lagoon area near the river mouth. The area is home to a number of seals who would pop up in the water for a few moments, before disappearing down underneath for quite some time – presumably looking for fish. There were quite a few calmly swimming around whilst stunned tourists looked on, some scrabbling for their cameras trying to get a shot. You had to be quick with the camera to even get them, which is why I love the picture above. Not only did I get a seal actually in the picture, but it looks good too! It’s one of my favourite photos from the trip, even if it did take half an hour or so of patience to get it. Our time had come for our boat ride round the icebergs so we put on our cheese coloured life jackets, and set off in an old US Navy suface/water vessel painted gaily in white. Once out in the water, the camera went full action – it was a truly beautiful place. Half way round the boat stopped whilst a guide jumped into our boat and told us all about the area. 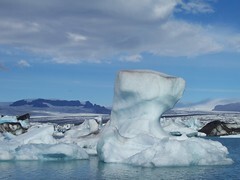 The icebergs with green and blue colours were those that had recently broken off from the glacier, and had floated into the lagoon, whilst those with black tops were icebergs which had overturned. Each would slowly melt away over the next few weeks, replaced by new ones freshly broken off. 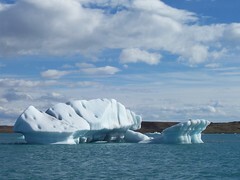 The ice is incredibly old and very slow melting – as some was passed round the boat. It’s also not going to last. The glacier is in retreat. Around 50 years ago, people didn’t even know the lagoon was there due to the expanse of the glacier. But it’s slowly departing, shrinking back every year. Stunningly beautiful the place may be now, but in a hundred years time, there will be little to see. Enjoy it now, whilst you still can. The glacier shrinking was something we’d see at our next stop too – Skaftafell National Park which is one of just four in the country. It’s main draw is the glacial tongue that sits on one side of the park, as well as being a base camp for campers and hikers in the area. 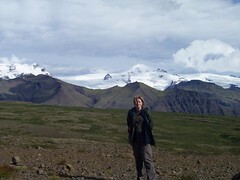 After eating our sandwiches we walked along a flat trial to the snout of the Skaftafellsjökull glacier. Catherine wanted to walk on the ice – just a small bit as serious trekking needs an ice axe, crampons and most importantly of all, a guide. 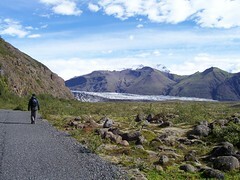 As we walked along the trail, signs and markers showed just how much the glacier was in-retreat. 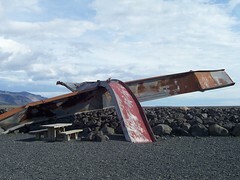 At one time, it went all the way up close to the visitors centre, but was now more than a kilometre away. How long what’s left will last, is another matter. Catherine’s plans to walk on ice were thwarted however by one simple fact – we couldn’t get close enough. At the end of the trail we were confronted with a slight problem – huge puddles of melted water which meant we were unable to get too close. Instead we walked back to the visitors centre, and up on the other side. 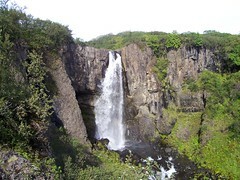 Whilst one side of the park is very much barren, desolate looking glacier and mountains, the otherside is pretty hills, lovely fauna and waterfalls – including Svartifoss, a lovely little waterfall set against a series of basalt columns. It was up a hill of around 150m, although the impact of our hard work was rather spoilt by the coach load of tourists who had clearly been driven up the hill and were getting in the way of all our photos. Skaftafell is a beautiful park and we had a few hours, so we walked on up to the top of a hill which gave us some quite frankly stunning views of the surrounding area. Judging by the normal itinerary, we would have been able to stay there for a few more hours, but our late booking meant we were unable to stay in the area, so reluctantly we headed back for the car, not before walking past even more attractive waterfalls – this one hidden off on a little side track, clearly missed by many. Driving out of the car park, we did stop briefly once more. This time to see a bridge. Or at least, the remains of one. In 1996 Grímsvötn, one of Iceland’s most active volcanoes, erupted. 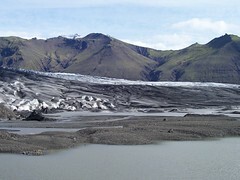 Normally Grímsvötn eruptions aren’t big and don’t get through the icecap, but in September 1996 a 4km fissure had opened between it, and another volcano. The melt water was expected to burst out at any moment. The eruptions started on 29 September 1996, and continued until 15 October, but there was no burst. No one was quite sure when or indeed if it would burst. It did on 5 November at 0830. At one point over 50000 cubic meters per second of water was flowing. Icebergs went out to sea. Power lines were swept away, the road bridges tore apart like they were paper. Just off the main road are the remains of one of those bridges, now cited in a small lay-by with an information board. Its metal girders twisted and torn beyond all recognition. Incidentally, despite the destruction and the chaos, within hours of the water subsiding, the road gangs were out and on the case. The destroyed road was part of road 1 – Iceland’s ring road – and, amazingly, it was open merely a fortnight after the event. There’s a fascinating video showing all this in the Skaftafell visitor centre, which features footage taken during and after the video, along with a more in depth explanation of what happened and why, which we’d seen just after heading off for the waterfall earlier. As usual we had quite a way to go to get to our evening stay, and the fact we weren’t staying where our itinerary thought we were, meant that we ended up seeing several things actually due for day seven. We also had another problem. The winds were blowing which was causing no end of problems as I drove our little car down the road, trying not to let the gales blow us onto the other side. To add to the fun, we were passing through a large sand plains which have been known – in really bad weather – to strip the paint off cars. Something which, incidentally, is not covered by Icelandic car insurance by law. 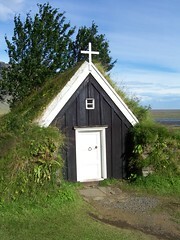 We got through intact and arrived at Núpsstaður where a tiny turf chapel sat alongside a farmhouse – both of which were dwarfed by the large cliffs in the background. It was a tiny church, probably holding about nine people including the priest. Quite who uses it, I couldn’t say. Besides the farm house, there was nothing around in this remote, windy location. Yet apparently there are still some services there. 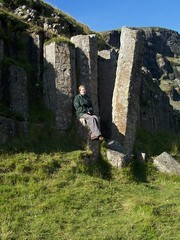 After that, we drove down the road to Dverghamrar – a series of dwarf cliffs which feature some impressive basalt columns. It has to be said, that even in the remotest, quietest tourist attractions, Iceland always makes effort, with at least a large information sign present. Here we were also treated to a well marked little trail which took you round the cliffs. Our stay for the night was 6km down the road from the village of Kirkjubæjarklaustur which seemed to feature a supermarket, a cafe and a petrol station. Doubting there would be much at our guesthouse (which was in a small hamlet) we popped into the Systrakaffi cafe where we parked up in a very windy car-park and half expected it to rip the doors off, and pick up the car and roll it down the road. Thankfully it didn’t and we went inside for some quite frankly lovely pizza and a coffee, before driving on up the road to Hunkubakkar where we’d stay the night. On arriving (and still on the road) we found that our guesthouse (which not surprisingly given the lack of facilities, also did evening food) housed people in other peoples houses, so we found ourselves in a room in the house of an elderly Icelandic couple who spoke little English, but were very nice. A woman with an unpronounceable name greeted us at the doorstep, but that seemed to be the extent of either of our lingustic abilities so that was that. There was also a very nice shower, but it all felt rather wierd – after all, where were the boundaries? We were in someones home – was it strange therefore to sit in our room and read, or would we be frowned upon for sitting at their table and planning out our next day. 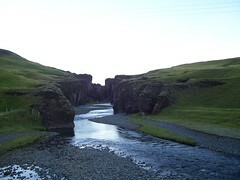 In any event, we decided the solution was to do neither of these things, but to walk up to the nearby Fjarðarglijúfur gorge – a couple of kilometres walk away. Despite the strong winds making it quite a hard walk, and the fact that the sun had gone in, it was worth the effort. This beautiful little gorge really was a sight to behold – and being off the main road, one that most simply wouldn’t see. As a last sight to the day, it simply couldn’t be beat. See more photos than I could ever dream of fitting on this page, all of Iceland! Behold! Lots of icebergs too!